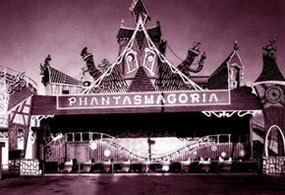 Here I go again with more blabbery about the S.S. Adams prank and magic company. This time I thought I'd showcase the progression that their packaging has made over the past 100 years which includes my own contribution to their visual lineage. It's an interesting case study that reflects the broader history of American design to some extent. Black ink on white card stock; no frills to speak of but it did the trick. And the beautiful illustration by Louis Glackens even gives it some class. 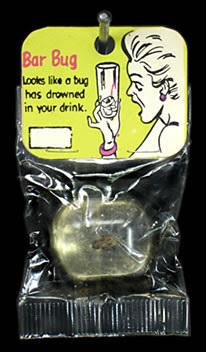 Novelty items like this were usually kept behind glass in a store display case so the package had to serve as a mini billboard that offered everything a customer needed to know at a glance. It reminds me of a three dimensional catalog listing. Notice that the product was held on with a single staple. This worked fine since the clerk was the only one with access to the item. 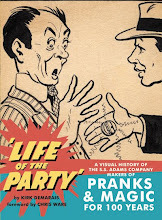 Back when this was for sale the idea of commercially manufactured pranks was very new and the streets were filled with suckers. All ages and social classes got in on the mischief. 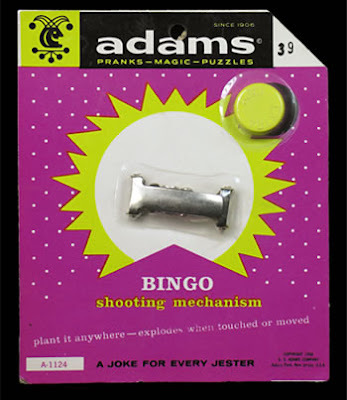 Four decades later, pranks were pretty much considered children's toys. 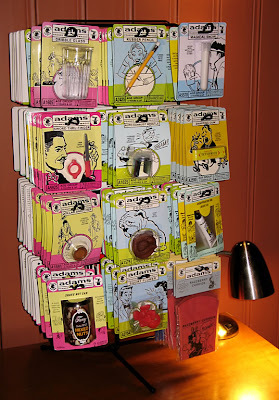 Products were now exposed to handsy customers and "peg racks" were standard. As you can see the packaging evolved accordingly. 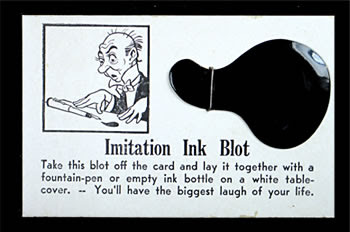 A dime store-friendly header card with a peg hole was introduced, and the product was sealed in protective cellophane. The use of color (albeit limited) made it more eye-appealing, especially to youngsters. And in following with the times, the illustrations became less ornate and more casual, as did the typefaces. 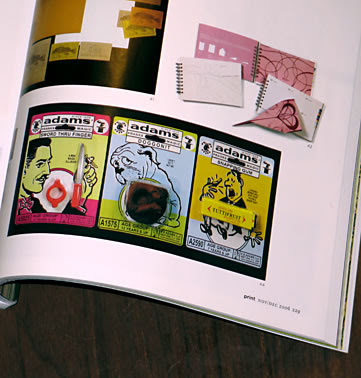 Adams sought a form of packaging that was even more versatile, so they continued to research formats during the late 50s. That's when the Stretch Pak was born. 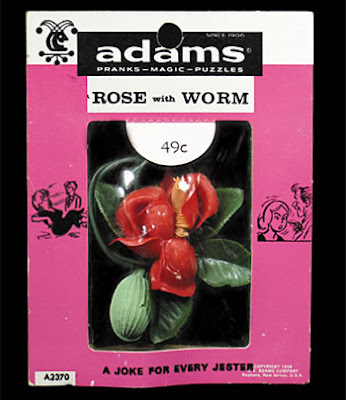 The cardboard frame was sturdier and the cellophane window could accommodate almost all of Adams' products which came in a broad range of shapes and sizes. The uniform containers looked better and made it easier on shopkeepers. They were more cost effective because thousands of blank Stretch Paks could be purchased at once, and an in-house press customized small batches with product name and illustrations according to the contents. 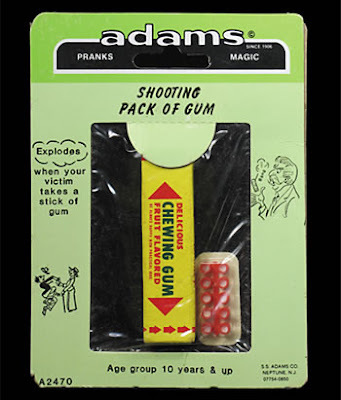 Adams put blister packs to use long before it became a widely accepted form of packaging. 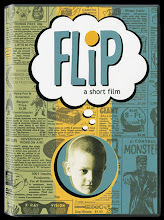 The card served as a canvas for eye-grabbing graphics that were unique to each individual product. The blister packs were as durable and accommodating as the Stretch Paks but the new machine that produced them gave workers continual problems which eventually tipped the scales in favor of the Stretch Pak. In the 1970s an advertising agency was employed to give the Stretch Pak a face lift. They picked a new color pallet, streamlined things a bit (including the corners) and did away with the joker icon (a top hat icon was used on magic items). The change wasn't drastic, but the outcome was pretty subdued. 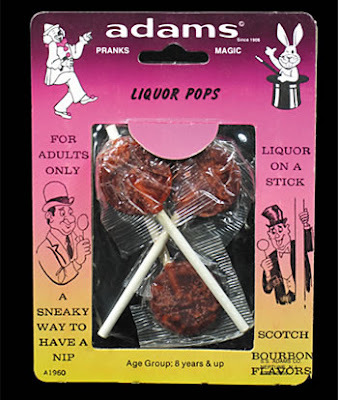 Yes, Liquor Pops. The mechanics of the Stretch Pak continued to serve the company well, though they opted for another cosmetic revision in the 1980s, presumably to stay competitive. Cartoonized icons and a new color gradient gave it a more lively look. They were ahead of the pack when it came to the gradient, however they used this same design for well over twenty years and it seemed dated shortly after the digital design revolution in the 1990s brought on gradient overkill. This is where I came into the picture. But let me back up. Once upon a time I was bidding on a routine ebay auction for some old Adams junk. All was normal. I won the auction. Still normal. I noticed the seller's address was near Neptune, New Jersey, home of the Adams factory. Hmmm. 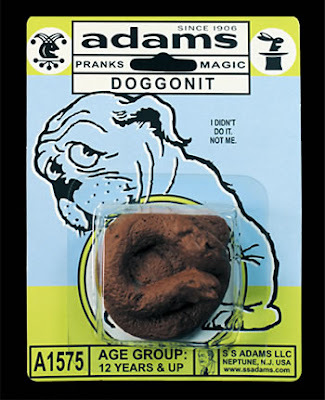 furthermore I notice that the seller's last name was Adams. Aha! Turns out the seller was S.S. Adams's grandson Chris who was still running the business! He indulged me by answering an onslaught of questions, and he eventually became a pen pal of sorts. I started mailing Chris any of my little art projects that had anything to do with pranks or novelties. I wasn't fishing for work, honest. I just knew that he, unlike most folks on the planet, could appreciate my stupid obsession. One day I got a fateful email from Chris asking if I'd be interested in doing some design for them. Wait, let me put this in perspective... back when I was teaching myself PhotoShop on a laptop that someone had given to my mom, I used to come up with these fake little assignments for myself so that I could learn the program and build my nonexistent portfolio. As an avid Adams-lovin' guy my obvious dream job was to design for them, so I created a phony catalog layout for my favorite prank company and proudly stuck it in with the rest of my malnourished body of work. (Incidentally my design was terrible.) But you see, when you're sitting at your mom's laptop in a small Arkansas town you just assume that there are other, more preferred candidates for the next S.S. Adams design campaign. Even years later, after I had started designing for a living I was known for my watercooler soliloquies on how I would handle an S.S. Adams Stretch Pak re-design. So maybe you can understand why Chris's email caused my brain to melt. My first job was none other than a catalog redesign. Anyway, for my next assignment I was asked to give the Stretch Pak the ol' "retro modern" treatment. (I can do that!) I knew that it would be criminal not to re-employ the company's rich archive of product illustrations.. so that was a given. I also gave it a fun, brighter color pallet that echoed the earlier designs and I re-introduced the joker and rabbit-in-the-hat icons. I intentionally made sure that the blacks were grey and the whites were off-white to give a subtle feeling of age. I also purposefully made the illustrations appear to be "off register" (which means not matching up correctly with the other colors, causing a ghosting effect) since that's the way they often appeared in the backs of comic books. My finishing touch was making an icon out of the founder, Samuel Sorenson Adams and putting his illustrated profile on the bottom of each package. As Chris Adams put it "Now he's kind of like Betty Crocker." All in all, the final product has sort of a poor man's Charles Spencer Anderson feel, though Anderson has since given his blessing to the design. But now I shall reveal the secret inspiration for this post.. the fact that my Adams packaging made it into the 2006 Print Magazine design annual! This is thrilling for me because I've been ripping of-- um, inspired by stuff appearing in Print for years, hoping all the while that I might someday make the cut. The fact that it's my Adams stuff makes it a two-in-one dream come true, and if I were standing behind a podium right now I'd thank God for such a tailor made blessing. This post certainly isn't meant to sound braggy. I see the whole thing as a small miracle and I hope that maybe you'll find some manor of inspiration within my tale. It's the result of hard work, a positive outlook and a lot of faith. So if you happen to find yourself bored in Barnes & Noble anytime soon, you can grab a copy of Print, flip to page 229, and check out my work on the plastic dog crap. Thanks for the history lesson! I wondered how you got such a great gig, and now I know: gumption and talent! You SHOULD be proud and not worried about "bragging." I'm glad to see Adams moving forward graphically and that you're behind it. 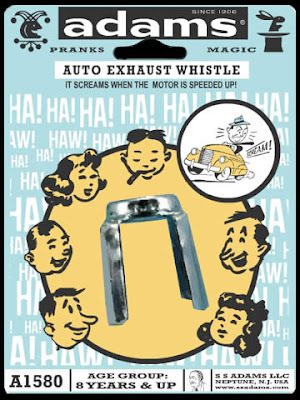 I actually prefer the first Auto Whistle mock-up over the production version. 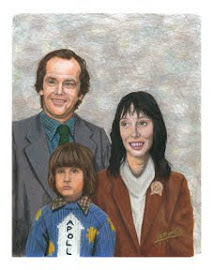 I'm looking forward to the new Adams catalog. Any idea when it hits the streets? 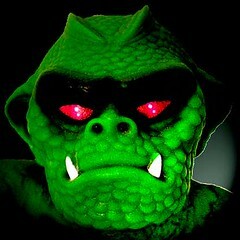 btw, do yer peeps know some images have been mia fer a while? Hey Kirk! Congrats on being in Print Magazine! I'll be showing the folks in class! Good to show that an Arkansas boy can get some ink if his work is good enough! 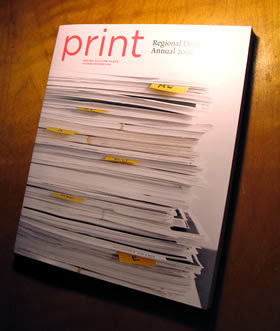 Congrats on the Print Annual! I've been ripping... um, inspired by them for years too! That is awesome and I look forward to getting your book. Yes, you've done a fantastic job bringing the true Adams identity back with your clever packaging art and of course with the new history book. Job well done!! Thanks all for your well wishes! K2- and don't forget shopping on ebay. It's always life-changing! Brian- The catalog I'm currently working on is 96% finished and should be printed in less than a month. Gentle- as soon as I finish the new catalog, we'll update the one on the site. Those pics have been gone for a while now. It's magic! Travis- Right on! someday this place could be a designer's mecca. brainwerk- I could tell that you were a good designer from the moment I laid eyes on your blog's great logo. Todd- thanks! David (Adams co-owner) recently said to me.. "Over the past two years there's probably no other human on the planet who's spent more time looking at images of pranks and magic than you have." This is exactly the type of thing that inspires the most. It reminds me of when I first read Robert Rodriguez's book on the making of El Mariachi, down to earth and it shows where the love of a particular medium can turn into. Awesome. My sincerest congratulations on your work's appearance in PRINT. That's excellent! Very glad to see it. Keep up the terrific work, Kirk. smurfwreck- Rodriguez is indeed a living inspiration. I love that quote of his.."if you're creative and technical, you're unstoppable." bleeding skull- Hey thanks, really. Having seen your design skillz, I wouldn't be surprised if you've been in 'Print' or 'CA'! Beautiful work. Excellenct retro design, nice placement of images and text, and good choice of colors. And a very nice post too. Congrats on the recognition in Print! The underlined text in the article is a bit awkward to read, but the story is fascinating enough to overcome it. Hi Chad- boy, thank you very much for your encouraging words! and thanks for alerting me about the underlined text. It was unintentional and since I always see this blog in Firefox I wasn't seeing the issue. Your comment prompted me to open Safari and yowza, how annoying. Anyway, I think I fixed it. Your blog looks very cool by the way! 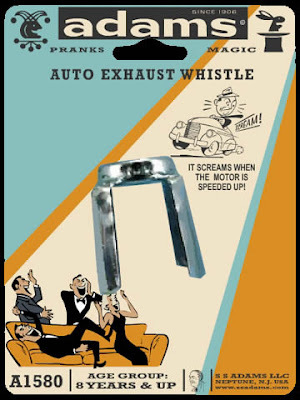 One of my favorite magic tricks was the little plastic box with a slide-out drawer. You would put something inside and close the drawer; tilting the box to the side would cause what sounded like a ball bearing to "hold closed" the real drawer, and pulling on the handle would reveal an "empty" outer drawer/shell. Chris- tis a pleasure to serve! Ah, Spencer's in the 80s- the forbidden fruit. I have the Adams Drawer Box that you speak of and know it well. It was still part of the catalog until recently, so you've got a good shot at finding one if you were to look. also, I used to abuse apostrophes for sport on this very blog. So know that if you come across it, I was just trying to be hilarious. It lost it's funny at some point so I'm far more "restrained" now. Nice job with bringing a fascinated eye to this niche. 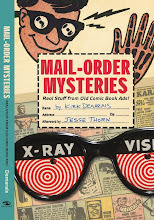 I have your 'Mail-Order Mysteries' book in front of me right now. I, too, got into 2 seasons of selling personal engraved Christmas cards with Sales Leadership Club which got me a cool microscope & prepared slides, but also got into Magic a bit even had two doves which I used in an act which won me some talent shows. I ended up working in a Paul Osborne show where I was able to present numerous illusions that otherwise would have been too cost prohibitive. Gave it up by 20 to pursue other show business interests, though. One cool memory that I thought you would appreciate was ordering a booklet on "Explosives" where all kind of accessible chemical recipes were given along with ideas of doing things like throwing a breakable mayo jar over a movie theater balcony setting off a combination of things that would clear the house with it's fumes. 'Terrorism 101'which after showing my parents managed to disappear in a far more tangible way that going into a pull or hidden chamber to be unloaded later. Have you ever heard of such a booklet? Thanks for getting the book and for sharing your tales! It's great that you've had unique, hands on experience with Mail-Order, Magic, and Pranks in their heyday. I'm not familiar with the explosives book you mentioned. I wonder if it came from a do-it-yourself publication like Popular Mechanics or something because I've not seen it among comic book listings.